Cory: In our last roundtable on The Green Hornet, we discussed the kinds of things that television could (and couldn’t) do with lower-rung superheroes. The Six Million Dollar Man and Steve Austin take this idea further because he’s not really a superhero in the traditional sense. There was an origin story and there are genetically-modified abilities, but there isn’t a costume, or much of an alter ego. And yet, Steve Austin is actually the kind of superhero that television does all the time, for a number of different reasons. Too expensive to get the rights or film the action sequences for a high-profile comic book character? Loosely adapt a best-selling book instead. Feel like comic book characters like Batman or Superman are too unrelatable or feature cartoonish villains? Fine, just make the superhero a more TV-like normal dude that stops “more normal” criminals. Although we probably don’t think of characters like Steve Austin or the Bionic Woman or Chuck Bartowski to be superheroes, the differences between those characters and more recognizable superheroes aren’t that pronounced. “The Seven Million Dollar Man” features a plot we’re used to seeing in superhero stories. There’s always someone else who obtains the hero’s abilities, if even temporarily. The Six Million Dollar Man wasn’t afraid to go to this well more than once, as the backdoor pilot for The Bionic Woman offers a similar story: Someone else near-death gets the bionics and Steve has to work with them to figure it all out. Whereas things worked out a little better for Jaime Summers, this episode’s bionic guest star Barney Miller (you’d think this is some kind of weird joke until you realize that Barney Miller the show didn’t debut until a few months later) is kind of a prick. He of course wants to use his abilities for more selfish and perhaps nefarious opportunities, something the unbelievably good Steve just can’t stand for. After the initial confusion of Steve learning that Oscar and company lied to him about the existence of another model, he and Barney sort of get along. They work together, reveling in a shared experience no one else (yet) can understand. But as these things go, Barney becomes a problem and Steve is forced to show him what it really means to be a cyborg. You know, with great power and all that. As a makeshift superhero story, this is all fine, if familiar. Steve’s the kind of do-goody hero that isn’t that appealing to me, but he works in a procedural framework that mostly asks him to show off his mechanical abilities, very slowly of course, and occasionally emote. The opening scene suggests that he’s grown quite a bit since his accident, which I’m guessing is mostly just that he’s not freaking angry and terrified and confused that he basically died and then became a robot dude. It’s really unfair to knock any special effects work for its age, but I found the slow motion set-pieces to be (accidentally) indicative of the show’s general glacial pacing. This episode clocks in at almost 50 minutes, but feels like about 90. Steve fights slowly, and also thinks and speaks slowly as well. It’s quite ponderous, to the story’s detriment. But then again, this is also the first show we’ve watched for the roundtable that was officially an hour long. Perhaps there’s something to be said for that shorter running time? Cameron: “What if?” is a very powerful question for fiction. If you’re hewing closer to reality, the what-ifs become ways to place a character’s hopes, visions, and actions on a scale of optimism or pessimism. Genre, of course, loves what-ifs, and the history of comic books is loaded with what-if offshoots that take a simple but powerful change in a comic’s origin (like “What if Superman had landed in rural Russia instead of rural America?”) and spin the idea into a brand new story that relates, metatextually, to the original. In the history of television, Barney Miller’s dilemma in contrast to Steve Austin reminded me most strongly of the conflict between Buffy Summers and Faith Lehane in Buffy the Vampire Slayer (and to an extent, Angel). It’s almost remarkably striking how similar Faith and Barney are. Both characters share the same specific powers of their heroic counterparts (Faith is a Slayer, Barney is bionically enhanced) yet both characters also have a deviation in their origins. Barney makes a note of having clearly consented to the operations that made him bionic, whereas Steve had no such option, having been near-death when he was recovered. Similarly, it’s clear throughout Faith’s arc in Buffy season three that she grew up in a very different home environment from Buffy, which consequently made her rougher on the edges than the slightly more well-adjusted blonde Slayer. These deviations are really the only gaps between the main characters and their darker (or “what-if”) counterparts. Buffy and Faith are fairly evenly-matched, since their power is drawn from the same source, and Steve gets a jab at inflation when Barney mentions that he cost a million dollars more than Steve did to be reconstructed. Even the character arcs are similar; towards the end of “The Seven Million Dollar Man,” Barney asks Steve to kill him, echoing Faith’s sentiments to Angel at the end of Angel episode “Five by Five.” It’s the vulnerability after the fall of pride that makes the redemption stories so damn compelling. Moving away from that topic, I agree with regards to the egregious use of slow-motion for the action sequences. It seemed such a blatant way to cheat the action scenes out of being fun and/or visceral, and it also played as a way to drag out the clock so that it would meet the 50-minute mark. But the premise, which gets reused for the spin-off The Bionic Woman, is a sound one, and one that I think reverberates even today. Biotechnology is simultaneously as old as science fiction itself and as new and current as you can get with regards to current events in science and technology. There’s a bit of an ethical spin in this episode given that Barney seems to have come after Steve: should Steve have only been a one-off job, a long-term experiment to be observed with great care over many years? Did the science team push their limits in trying to save Barney’s life? I’m curious to find out if the show ever picks up on this side of its premise. Goodness knows not enough science fiction television these days handles ethical concerns with great care. Whitney: It’s interesting that you bring up the ethical issues of each man’s transformation into a multi-million dollar bionic man. The parts in the beginning of the episode before Barney Miller is revealed to be bionic as well at least show that the team behind Steve were attempting to walk Barney through the transition properly. It seemed like they knew because he made the choice to change he might theoretically be alright with his new self, but were still taking the necessary psychiatric precautions in regards to how he would handle becoming a human weapon. Obviously, that didn’t quite work. It’s telling that Steve Austin was able to help Barney out a little bit near the end, even if at that point it was too little too late. Maybe he wouldn’t have become so self-absourbed and destructive with his abilities? It isn’t clearly laid out for the viewer, but this episode does bring in enough doubt about the team surrounding Steve and their decision making when it comes to their experiments. How Steve reacts to them lying to him and later sending Barney Miller out on a mission before he was ready really does bring into question whether Steve Austin was an anomaly of an experiment and shouldn’t be replicated no matter how helpful he is to the government, or if Barney Miller was the anomaly who couldn’t handle being a different person. Overall, I think this was my favorite episode we’ve discussed up until this point. The slow motion bothered me as well, but I think it was only because of the itchy trigger finger they had when using it. If they had limited it to one scene in the episode (such as when Steve realizes what Barney has become due to his abilities) I don’t think I would have been quite so bothered. I quite enjoyed the little character moments the show gave almost every pair of people in the group, even having never watch an episode of The Six Million Dollar Man before I could tell some of the history behind each relationship. The scenes between Steve and the nurse were particularly nice. You could tell how hurt each was about the the other seemingly betraying them after all they had been through together. 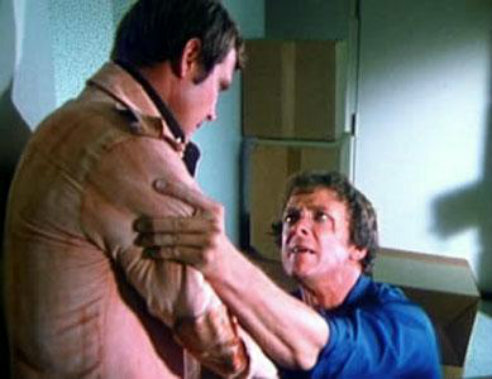 There was emotion and backstory involved in every interaction (even if Lee Majors face didn’t always express that). I also enjoyed actually hearing the theme song connected to the show. It’s one of the most famous intros of all time, and it made me miss even more the days where a full minute of run-time could be used for a creative explanation of the show and past events. I think I would have found this episode of The Six Million Dollar Man more interesting if it was actually about Barney. Barney’s struggle to rein in his desires for self-gratification and violence–caused just as much by his thrillseeking race-car-driver past as it is by his bionic enhancements — were far more interesting than the boring, plain Steve Austin. And while the show paid quite a bit of lip service to the idea than Austin struggled with the same problems as Barney, that was never in evidence. In fact, Oscar seems to reach the conclusion at the end of the episode that Austin’s transformation worked because Austin is just that awesome. If Steve is flawed, it’s hard to tell through slo-mo fighting and that stone visage of his. It would have been nice to see something out of Austin other than stern disapproval of Barney’s recklessness. I know that Barney’s arc was pretty self-contained and finished by the end, but I would have liked to see a season or two of The Thirteen Million Dollar Men. And Cory, I definitely think carving twenty minutes out of “The Seven Million Dollar Man” would have helped tremendously. This episode had a unbelievably draggy pace, even setting aside the endless slo-mo. 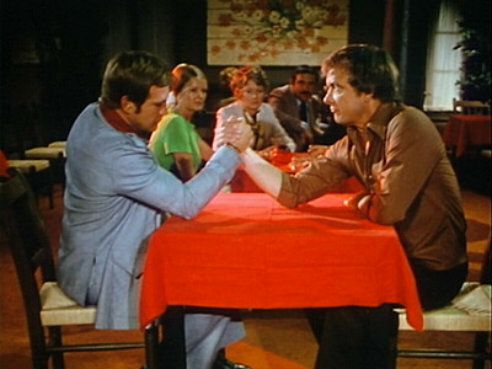 The arm wrestling scene, for instance, went on forever, like the editor was desperately trying to fill out the hour. The very last thing an action series should be is slow and plodding, especially one with a concept as interesting as this. I’ve never known of anyone being dissatisfied with the use of slow-motion in SMDM before. At the time, it was a HUGE part of the show’s appeal. You have no idea (I guess ya had to be there) how many hours kids of the ’70s spent in the backyard running, jumping, fighting in “slow motion”–of course, while also doing the “nuh-nuh-nuh” sound effects with their mouths. The producers came up with the slo-mo idea after early episodes showed Steve running fast by undercranking the camera or putting Majors in the back of a truck driving 50 mph. It, of course, looked ridiculous. A good discussion might be your ideas for better ways of showing bionic action than slow-motion. I can’t think of any, at least not that could be done on a five-day shooting schedule (according to Harve Bennett) and a Universal TV budget. Though, as I mentioned, the slo-mo was very popular with kid audiences, and I honestly doubt the series would have lasted five seasons without it. Monte Markham, ubiquitous in ’70s television, is perfectly cast as Barney (renamed Barney Hillyer in the sequel), as he always seemed too smug to play heroes. Funny, I was just in a Twitter discussion with a TV expert dissatisfied with Majors’ acting. I don’t know–I love the guy. Limited range, yes, no question, but his and Bennett’s choice to make Austin something of a tightlipped Gary Cooper definitely resonated with audiences. You rooted for Steve, no question, and Majors was pretty good with the occasional quip. He had good chemistry with Richard Anderson and Lindsay Wagner. SMDM was wisely built around what Majors could do, and it worked well enough for five seasons. I was there–we loved Lee Majors and we loved Steve Austin. I still do. BTW, I’m glad you didn’t suffer “A Bionic Christmas Carol.” You may not have made it to the end. Whether you liked this ep or not, it’s pretty representative of what SMDM was about and one of its more fondly remembered eps.